All Khalil Mamoon Hookahs are handmade in Egypt promoting the most traditional smoking experience you can find. The KM Lebnani is a beautiful and elegant piece of art that doubles as a fantastic smoking piece. The gold accents provide an eye catching glare and the heavy metal stem provides a durable design for ease of setup and maintenance. Product Disclaimer Please make sure to Click Here and view our Khalil Mamoon Hookahs disclaimer before ordering this beautiful hand crafted Hookah model. 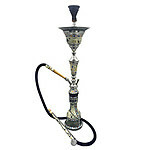 Variation Warning All KM Hookahs Are Unique And The Stem, Vase, And Hose Patterns And Colors May Vary From The Color Selections and Photograph Listed Above. Click Here To Contact Customer Support If Further Clarification Is Necessary Prior To Ordering This KM Hookah model.